Add flexibility and interactivity to lessons with a scalable display size of up to 100 inches (254cm) and a range of sophisticated features. Embrace an exciting new world of education by creating a learning environment where students get a perfect view from anywhere in the class, can make on-screen contributions and even take part using their own smart devices.  Epson interactive teaching solutions give teachers the freedom to create digital learning experiences that meet the expectations of today’s technologically aware teachers and students, to promote participation and effective learning. 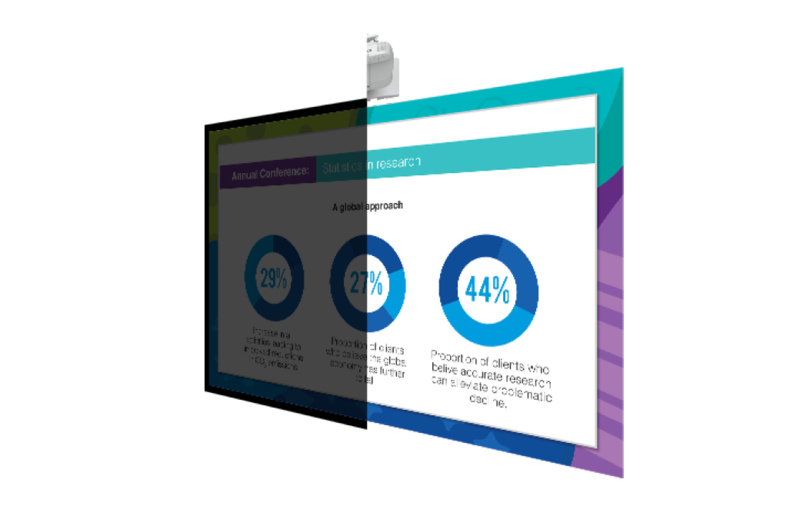 Within education, Epson has an interactive market share of 72.1% across EMEAR1. Whether in the classroom or lecture theatre, using finger-touch or dual pen interactivity, Epson’s interactive teaching solutions make it easy to display and edit a wide range of content. Annotate presentations in real time, write, draw and add comments and answers directly onto the screen, as well as saving and sharing collaborative work. Our new interactive pens are more comfortable to use, with hard or soft tips and battery life three times longer than previous models. Some projectors also feature finger-touch control for even easier involvement. 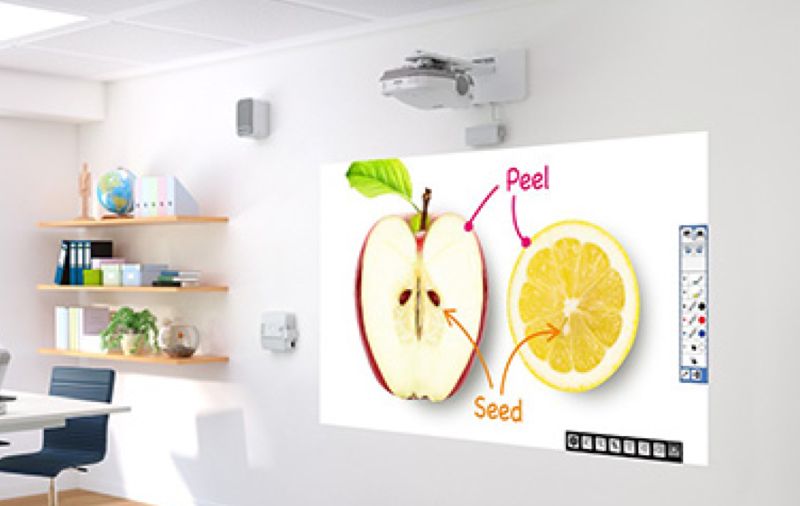 Epson education projectors offer dual pen interactivity (EB-710Ui, EB-696Ui, EB-695Wi, EB-685Wi, EB-675Wi only) with a new pen design for comfortable writing and a choice of hard or soft tips, as well as finger-touch interactivity (EB-710Ui, EB-696Ui, EB-695Wi only). All interactive models have extensive PC-free annotation functions and enhanced moderator function, as well as split-screen capabilities and ultra-wide multiscreen interactivity. Users can also control additional equipment such as a document camera directly from the projector, and all models come with HDMI inputs, integrated 16w speaker and microphone input. Keep focused with PC-free annotation mode for instant access to whiteboard functions, and take direct control of your document camera from the projector. Make connections to PCs, DVD players, document cameras and more with multiple HDMI inputs. Change source quickly and maintain lesson flow using the new home screen that gives access to key projector functions and controls. Meanwhile optional Wi-Fi allows even more freedom of movement, as presenters are not restricted by cable length. Add a new dimension to teaching by writing, drawing and adding comments and answers directly onto the screen. The new interactive pens are more comfortable to use, with hard or soft tips and a three times longer battery life. Some projectors also feature finger-touch control for even easier involvement. Share content between class members with the Multi-PC function which enables up to 50 people to share content from their PCs. The enhanced moderator function gives the teacher an easy way to choose up to four of them for display on the screen at the same time. Create one huge ultra-wide screen interactive surface with two projectors working seamlessly together. Multiscreen interactivity means that the full image area can still be used for interactive features. Add depth to learning with our split-screen feature that can show content from two different sources, such as a lesson plan from a PC and a still image or video clip from a document camera. Bigger screen size means better visibility and greater readability all the way to the back of the room. 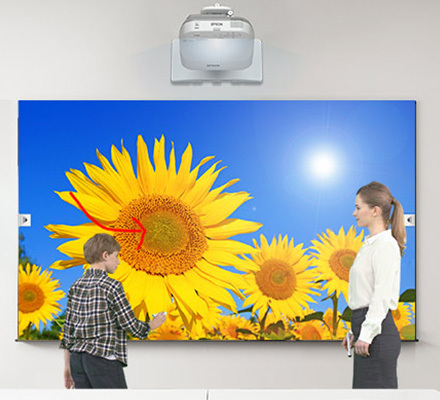 Epson projectors also offer easy connectivity, and are easier to handle and mount – a typical 70-inch flat panel can weigh 73kg, while the EB-696Ui Full HD WUXGA projector weighs just 8.3kg. Many flat panels have very shiny screens, meaning that content can be obscured by reflections from ceiling lights or windows. 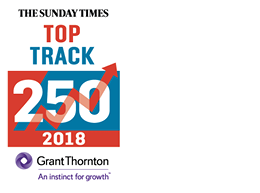 This isn’t a problem with an Epson projector, as it projects content directly onto a wall, screen or whiteboard, meaning no troublesome reflections. 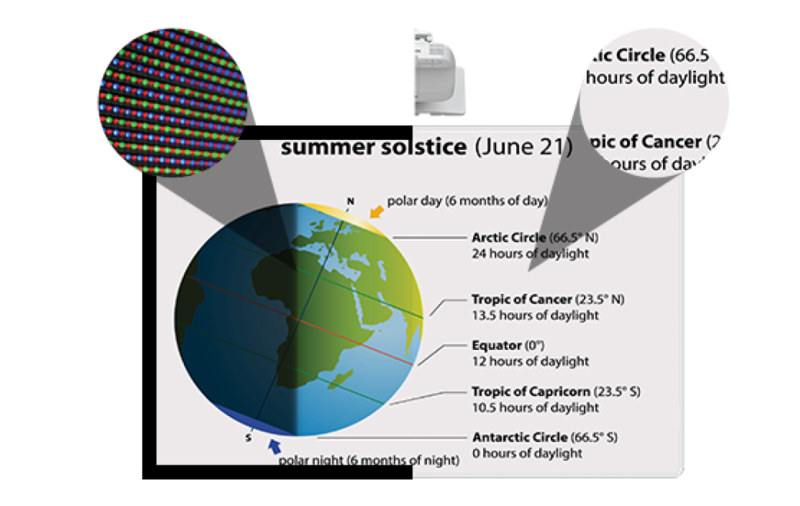 Also, Epson projectors are bright enough to be used in daylight without losing readability. Some flat panels have restricted viewing angles, making it hard to see content on the screen when not viewed from head-on. This is not the case with Epson projectors, which have no such blind spots, meaning everyone in the room can see content clearly. Flat panel RGB screens can appear pixellated when seen in close proximity for long periods – such as during interactive presentations or prolonged collaboration – potentially causing strain to the eyes. Projectors have less pixellation than flat panel displays, and with automatic light adjustment can be viewed in comfort for longer periods. Speak to your CCS Media Account Manager today for more information.